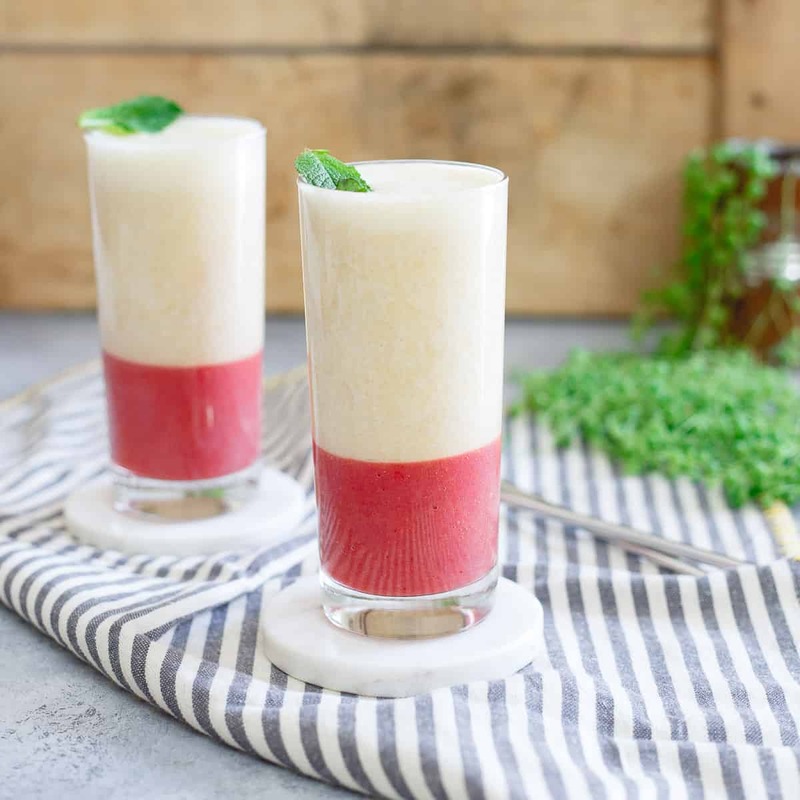 This layered strawberry ginger peach smoothie is refreshing and fruit forward with a healthy dose of protein from ultra-filtered milk. At some point smoothies got complicated. I can’t really pinpoint when the shift occurred, but sometime in the last decade or so we shifted from smoothies being a fun way to drink a bunch of a fruit to trying to make them these superfood-filled concoctions where it seemed like the more natural food store bulk bin seed/nut/powder/spices you could fit in there, the closer to God you became. 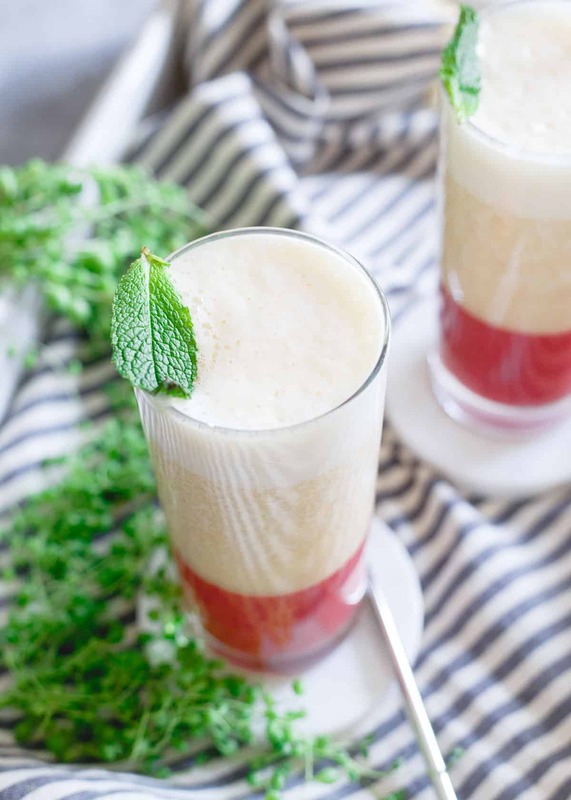 I wrote a post about how to make the perfect healthy smoothie awhile back and while I still stand by that simple process of how to build a smoothie element by element into what you want out of it, I sort of want to take a step backwards with this strawberry ginger peach smoothie to when smoothies were mainly just fruit. I had to make a smoothie for a work assignment recently that was literally just fruit and milk. As I was putting it together, I felt this pull to throw in more stuff. I was mentally eyeing up the chia seed jar in the pantry, the canister of protein powder in the cabinet below and picturing all the “toppings” I could throw in if I just poured it into a bowl (I do love a good smoothie bowl) instead of a glass. It was legitimately hard to stop myself and just put fruit and milk in the damn blender. I did it though and after the pictures were taken and blender cleaned, I took a sip. The simple kind of delicious where the ingredients shined through and suddenly I was calculating macros and figuring out how to work it into my already planned macros for the day. I ended up foregoing my beloved nighttime treat of an Eggo + Halo Top, a noteworthy accomplishment for essentially just some fruit swirled around in a blender. 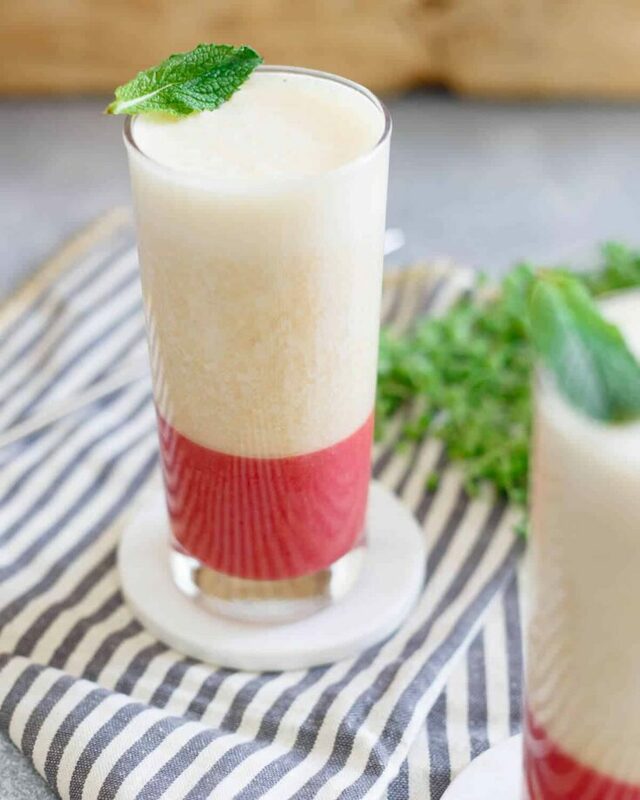 That smoothie inspired this layered strawberry ginger peach smoothie. 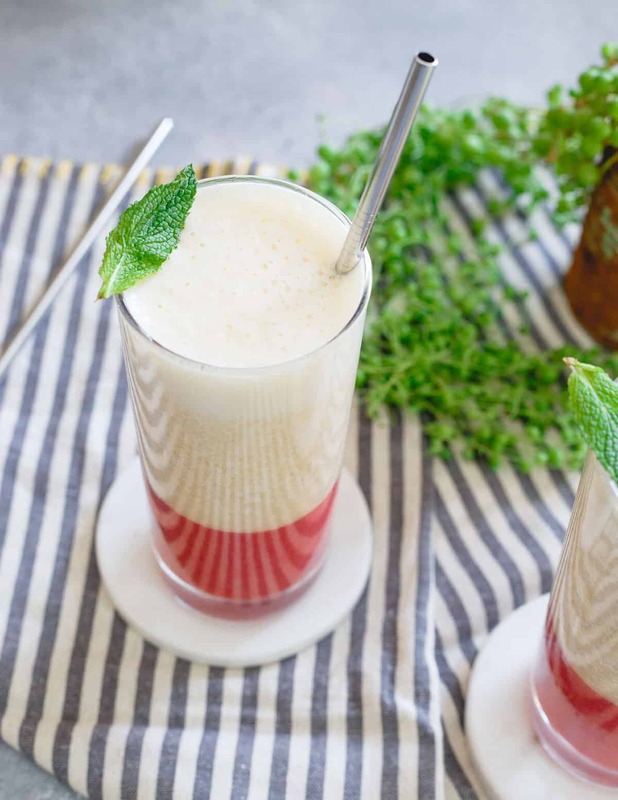 This smoothie is uncomplicated (you can even simplify things further by not bothering with the layers and just throwing everything into the blender at once if aesthetics don’t matter to you), refreshingly fruity with a tart punch and just enough sweetness. I chose to make it with an ultra-filtered skim milk for some added protein without needing to add the chalkiness of a protein powder. This way you still get that authentic fruit + milk smoothie taste (something no smoothie with protein powder can claim) but any milk will do. If you’re fine with a lower protein amount, use a nut milk, it will taste just as good. It might make me sound like a 75 year old curmudgeon but I’m gonna say it anyway – cheers to the good ‘ol days! Love this strawberry ginger peach smoothie recipe? 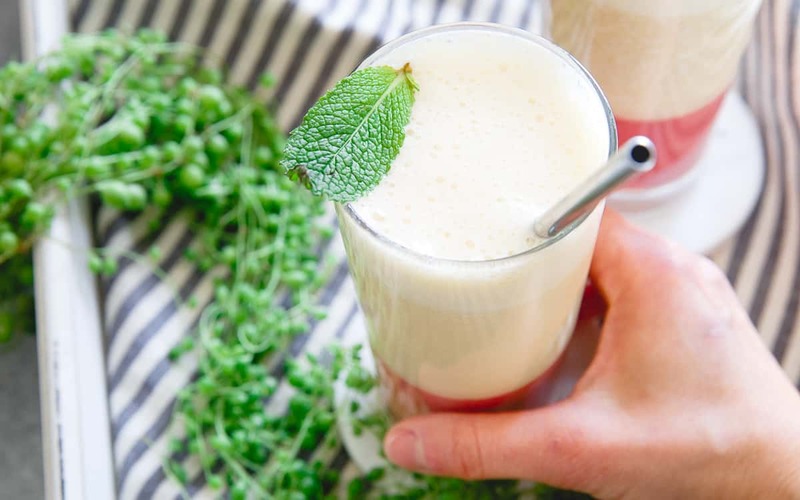 Try these other smoothie recipes: Guava Pineapple Smoothie, Wild Blueberry Beet Smoothie, and Roasted Apricot Green Smoothie. Combine the strawberries, ginger and orange juice in a high-power blender. Process until a smooth puree. Pour the puree evenly into 2 glasses and place in freezer for 10-15 minutes to set. Combine the peaches, banana, milk and vanilla extract in the blender and blend until smooth. Remove glasses from the freezer and slowly pour the peach layer on top in each glass. Garnish with a mint leaf if desired and serve immediately. *You can use any milk you like. Ultra-filtered milk like Fairlife will provide more protein than regular milk. Nut milks work great but don't have the protein content of regular or ultra-filtered milk. Coconut milk will also work! The smoothie looks really interesting. I never tried to mix the ginger with strawberry so really curious of the taste. Btw, is there any case that though we put the first layer in the freezer for around 15-20 minutes, when we add the 2nd layer they combine with each other? LOVE this smoothie! New favorite!